We’ve all done the pen pal schtick in grade school, right? Well, welcome to the 21st century version of it, with less paper and more audio. Pen Pals is Dos Hombres’ version of pen pal letter-writing, so get ready to make some friends from who-knows-where. After signing up for an account–which you can customize under the Settings tab–you can get right on to letter-writing with the Write a New Pal tab. There, not only can you compose your message, but you can also attach up to 3 photos and 30 seconds of audio clips. How cool is that? Once you tap Done, the message is magically sent to the inbox of another random Pen Pal user, so a reply might come from halfway across the world…or the next town over. (Obviously, you need an internet connection to use this app.) You needn’t keep the app open, either, for Dos Hombres have helpfully included push notifications that will notify you whenever a new message hits your inbox. Letting someone take a glimpse of the world around you is a powerful thing, which is something that we’re becoming more and more accustomed to, what with the advent of social networking sites such as Facebook and Twitter. Pen Pals strives to keep it a little more private by having us share with only a certain number of people that you choose to correspond with. It is a clean, smooth app that is both functional and pretty–in other words, a joy to use. There’s really no way you can become confused. Of course, the use of this app depends almost solely on the number of users actually active; if there are none other than yourself, it is a rather pointless endeavor. A feature I’d like to see added is the ability to switch to a landscape view, as it is easier to type a message out on. If you can actually find worthwhile pen pals, this app is totally worth the $1.99, so pick up your virtual pencil and start composin’. 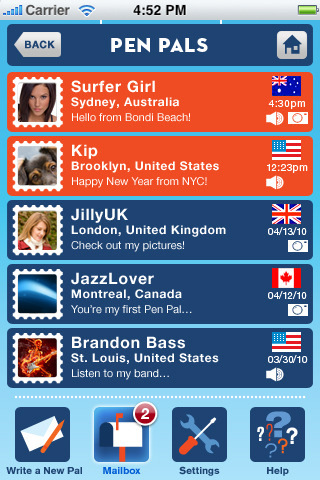 AppSafari review of Pen Pals was written by Julie Guan on May 13th, 2010 and categorized under App Store, Fun, Social. Page viewed 4852 times, 1 so far today. Need help on using these apps? Please read the Help Page.